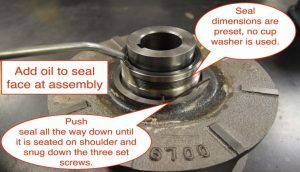 Let’s answer the common question we get about seals…“Yes” part number 6715U replaces part numbers 6715 and 6716 on the channel impeller 6” pump head (S6TC). The drop in replacement requires no special machining, no special tools and no cup ring. This uniquely designed 21” manhole pump has been one of our most popular pumps for many years. As we continually try to improve things, we again listened to our customers when they described some of the field problems they experienced. While they understood that the extended oil housing in this pump head helps to keep the oil cool and extends the life of the mechanical seal, customers said it was prone to catching debris and causing seal failure. Our customers asked for a better design that would reduce failures caused by wire-ties, plastic bags, rags, branches and other things that get jammed in the seal area. We responded by going back to the drawing board to make it better. With our own ideas on paper, we contacted our seal manufacturer to try and find a mechanical seal designed to hold up in one of the toughest of environments-the rental market! The result is the S6TC pump head’s new direct replacement seal, part number 6715U. This seal is also known as a bellows style seal because of its 316 stainless steel closed spring design (see the picture below of the #6715U seal installed). To make things even better, we also redesigned the extended oil housing casting in new pumps being built today by adding four cast in place kick down lugs which push away the solids in the seal area. And we added a pin to prevent the stationary half of the mechanical seal from rotating. (NOTE: If you are only replacing the seal on a repair it is not necessary to add this pin). To complete the upgrade, the seal faces are now made of silicone carbide to better hold up to the toughest mud, grit and fluids. The elastomers are made of Viton which resists a wide variety of chemicals and offers broad temperature operating ranges from 0° to 400° Fahrenheit. The three set screws hold the rotating section in place on the impeller hub. 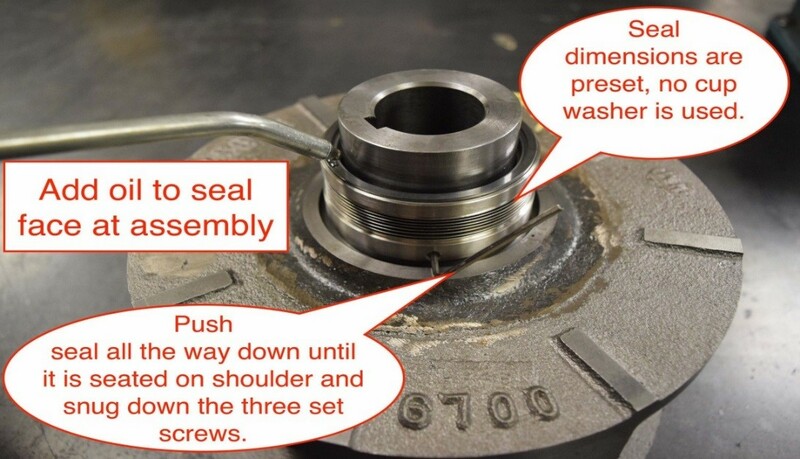 Since the seal height is preset at the factory, the mechanical seal and will be at the correct height when you replace the impeller on the shaft. As always, we appreciate your feedback on this and all of our products. With your continued support, Hydra-Tech Pumps will continue to make smart and cost effective improvements to our products, to benefit you.